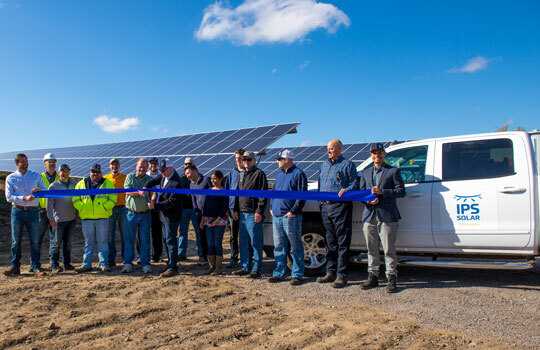 Under a blue sky and ideal solar conditions, IPS Solar, Egan Constuction, land owners and everyone who build this great array cut the ribbon and commissioned 9 MW of community solar in St. Joseph, MN. Following ATV tours of over 10 acres, we held a reception in the rolling fields and appreciated a job well done. After some brief remarks from the parties involved, we capped it off by enjoying some drinks and apps with our guests and media. This entry was posted in Community Solar, Events, IPS Projects on October 17, 2017 by Kyle Wehnes.